Fantawild (Fangte in Chinese) is a chain of amusement parks located in various cities of China. The first park opened in the mid-to-late 2000s in Chongqing. 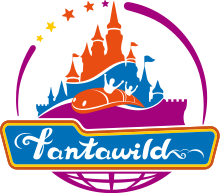 As of November 2013[update], ten amusement parks operate under the Fantawild name, with a further park currently under construction. The chain is owned by the Huaqiang Group. The mascot of the parks is a blue dinosaur named DuLuDuBi, and is typically used as the public image for the chain. ^ "Hi-tech parks open in China". Park World Magazine. 18 December 2007. Archived from the original on 3 December 2013. Retrieved 21 November 2013. ^ Marden, Duane. "Dream Land (Isfahan, Isfahan, Iran)". Roller Coaster DataBase. Retrieved 21 November 2013. ^ Marden, Duane. "Fantawild (Wenfeng, Anyang, Henan, China)". Roller Coaster DataBase. Retrieved 21 November 2013. ^ Marden, Duane. "Fantawild (Jingzhou, Hubei, China)". Roller Coaster DataBase. Retrieved 21 November 2013. ^ Marden, Duane. "Fantawild (Jiangyou, Mianyang, Sichuan, China)". Roller Coaster DataBase. Retrieved 21 November 2013. ^ Marden, Duane. "Fantawild (Taiyuan, Shanxi, China)". Roller Coaster DataBase. Retrieved 21 November 2013. ^ Marden, Duane. "Fantawild (Ganzhou, Jiangxi, China)". Roller Coaster DataBase. Retrieved 21 November 2013. ^ Marden, Duane. "Fantawild (Cixi, Ningbo, Zhejiang, China)". Roller Coaster DataBase. Retrieved 21 November 2013. ^ Marden, Duane. "Fantawild (Zhongmu, Zhengzhou, Henan, China)". Roller Coaster DataBase. Retrieved 21 November 2013. ^ Marden, Duane. "Fantawild Adventure (Jinghu, Wuhu, Anhui, China)". Roller Coaster DataBase. Retrieved 21 November 2013. ^ Marden, Duane. "Fantawild Adventure (Shantou, Guangdong, China)". Roller Coaster DataBase. Retrieved 21 November 2013. ^ Marden, Duane. "Fantawild Adventure (Taishan, Tai'an, Shandong, China)". Roller Coaster DataBase. Retrieved 21 November 2013. ^ Marden, Duane. "Fantawild Adventure (Shenbei, Shenyang, Liaoning, China)". Roller Coaster DataBase. Retrieved 21 November 2013. ^ Marden, Duane. "Fantawild Adventure (Shifeng, Zhuzhou, Hunan, China)". Roller Coaster DataBase. Retrieved 21 November 2013. ^ Marden, Duane. "Fantawild Adventure (Zhongmu, Zhengzhou, Henan, China)". Roller Coaster DataBase. Retrieved 21 November 2013. ^ Marden, Duane. "Fantawild Adventure (Binhai, Tianjin, China)". Roller Coaster DataBase. Retrieved 21 November 2013. ^ Marden, Duane. "Fantawild Adventure (Jiayuguan, Gansu, China)". Roller Coaster DataBase. Retrieved 21 November 2013. ^ Marden, Duane. "Fantawild Asian Legends (Qingxiu, Nanning, Guangxi, China)". Roller Coaster DataBase. Retrieved 21 November 2013. ^ Marden, Duane. "Fantawild Dream Kingdom (Chengyang, Qingdao, Shandong, China)". Roller Coaster DataBase. Retrieved 21 November 2013. ^ Marden, Duane. "Fantawild Dreamland (Jiujiang, Wuhu, Anhui, China)". Roller Coaster DataBase. Retrieved 21 November 2013. ^ Marden, Duane. "Fantawild Dreamland (Tong'an, Xiamen, Fujian, China)". Roller Coaster DataBase. Retrieved 21 November 2013. ^ Marden, Duane. "Fantawild Dreamland (Shifeng, Zhuzhou, Hunan, China)". Roller Coaster DataBase. Retrieved 21 November 2013. ^ Marden, Duane. "Fantawild Dreamland (Zhongmu, Zhengzhou, Henan, China)". Roller Coaster DataBase. Retrieved 21 November 2013. ^ Marden, Duane. "Fantawild Sci-Fi Theme Park (Jiangbei, Chongqing, China)". Roller Coaster DataBase. Retrieved 21 November 2013. ^ Marden, Duane. "Fantawild Theme Park (Nanjiao, Datong, Shanxi, China)". Roller Coaster DataBase. Retrieved 21 November 2013. ^ Marden, Duane. "Nantong Adventure Park (Gangzha, Nantong, Jiangsu, China)". Roller Coaster DataBase. Retrieved 21 November 2013. ^ Marden, Duane. "Oriental Heritage (Huaiyin, Jinan, Shandong, China)". Roller Coaster DataBase. Retrieved 21 November 2013. ^ Marden, Duane. "Oriental Heritage (Jiujiang, Wuhu, Anhui, China)". Roller Coaster DataBase. Retrieved 21 November 2013. ^ Marden, Duane. "Oriental Heritage (Cixi, Ningbo, Zhejiang, China)". Roller Coaster DataBase. Retrieved 21 November 2013. ^ Marden, Duane. "Oriental Heritage (Tong'an, Xiamen, Fujian, China)". Roller Coaster DataBase. Retrieved 21 November 2013. ^ Marden, Duane. "Oriental Heritage (Cixian, Handan, Hebei, China)". Roller Coaster DataBase. Retrieved 21 November 2013. ^ Marden, Duane. "Oriental Heritage (Changsha, Hunan, China)". Roller Coaster DataBase. Retrieved 21 November 2013. ^ Marden, Duane. "Silk Road Culture Expo Park (Xiongguan, Jiayuguan, Gansu, China)". Roller Coaster DataBase. Retrieved 21 November 2013. This page was last edited on 15 August 2018, at 07:59 (UTC).